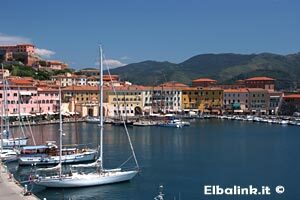 Do you wish to book a holiday on the Island of Elba or do you need any information? The island of Elba offers a marvellous variety of scenery, from small hidden coves to long sandy beaches; each corner of Elba holds its own special surprise for visitors. The island is washed by crystal clear water in every shade of blue - a paradise for divers and snorkellers. It's wooded hills make it ideal for hikers, it's panoramic roads so popular with mountain bikers. Those in search of culture will find it's ancient churches and museums a pleasant alternative to seaside activities. The Island of Elba is the third largest Italian island after Sicily and Sardinia and is the largest in the Tuscan Archipelago. 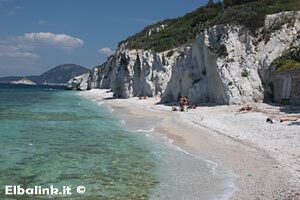 It has recently become part of the Tuscan Archipelago's National Park together with the islands of Pianosa, Capraia, Montecristo, Giglio, Gorgona and Giannutri. Elba has a coastline of 147 km: its main mountain (Monte Capanne) is 1019 metres high, accessed via pathways or by a panoramic cable car. Measuring 224 square kms, the island is situated 10 kms from the mainland with an excellent ferry boat service taking only one hour from Piombino to Portoferraio (the island's main town). 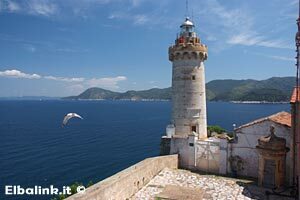 Elba has approximately 30.000 inhabitants, of these, 11.000 live in Portoferraio. The island is divided into 8 administrative "Communes". It has an asphalt road network of 160 km and 80 km of panoramic "macadam" roads. The climate is always mild with a middle annual temperature of ca. 16°; the medium in the winter is about 10° degrees, 14° in spring, 23° degrees in summer and 17° degree in autumn. The medium water-temperature of April is always about 19° degrees, 20° in May, June about 24°, 26,8° degrees in July, in August 27,3°, September 25,5° degrees and October 23,1° degrees. Already in acient times Elba's destiny was always deternined by two factors: its strategic position and the richness of its mineral resources. Due to these characteristics, it was often the object of conquest for the various powers along the Mediterranean. For the Etruscans and the Romans Elba represented an inexhaustible source of riches and the iron from Elba contributed to the prospering of their civilization. During the Medieval period Elba was dominated by Pisa. The remains of some important and striking defensive structures testify to the importance of possessing the island. The Appiani Lordship followed, as did the attentions of Cosimo de Medici, who built "Cosmopoli" on top of the ruins of the Roman city of Fabricia - now the capital Portoferraio - and had it surrounded with the impressive walls that saved the inhabitans from many pirate raids. The Spaniads settled in Porto Azzurro and they too made sure to construct defenses on their territory - the imposing San Giacomo Fort still dominates the pleasant landscape. In the more recent history, the period that made this island famous and placed it on the world map was the brief exile of Napoleon, who stayed here for 10 month prior to his 100 days adventure which was finished in Waterloo. Bonaparte left a significant mark of his short reign: important reforms and buildings like his Townhouse "Villa dei Mulini" in Portoferraio and his impressing summer residence "San Martino" - which are now museums and can be visited. The island first opened to tourism soon after 1950 but has managed to preserve it's waters, flora and fauna thanks to its local administration and inhabitants. A tiny airport services the island, permitting only small planes to land from a few privileged european cities. Most visitors arrive by car, others by train travelling to Piombino Marittima station which is very close to the ferry departures. Stayed three nights and would happily have stayed longer. You couldn't ask for more-everyone goes out of their way to ensure you have an enjoyable holiday experience. Really good value and I wouldn't hesitate to return. The hotel is positioned perfectly on the Western side of the stunningly beautiful island of Elba, in an elevated position with the most amazing sunsets over the sea. This is a great area for walking trails.